Founded in 1985, Habitat for Humanity Canada is a national, nonprofit organization working toward a world where everyone has a decent and affordable place to call home. 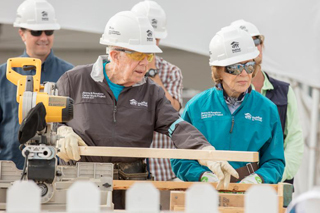 Habitat for Humanity brings communities together to help families build strength, stability and independence through affordable homeownership. With the help of volunteers, Habitat homeowners and 56 local Habitats working in every province and territory, we provide a solid foundation for better, healthier lives in Canada and around the world. For more information, please visit www.habitat.ca. Founded in 1991, Habitat for Humanity Edmonton is the largest Habitat for Humanity affiliate in Canada. The charitable organization is working towards a world where everyone has a safe and decent place to live. Their mission is to mobilize volunteers and community partners in building affordable housing and promoting homeownership as a means to breaking the cycle of poverty. Visit HFH.org for more information. Habitat for Humanity Manitoba is the local affiliate of a global nonprofit organization that has been working since 1987 toward a world where everyone has a decent and safe place to live. HFHM has partnered with local businesses, faith groups and thousands of dedicated volunteers to build homes for over 340 Manitoba families with over 1000 children having a better future. For more information, visit habitat.mb.ca.